They diverted 35.882 € to projects of peace and justice. 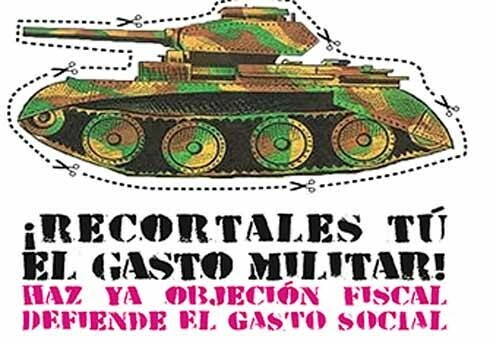 According to the “Report: Fiscal Objection 2018 Survey of Alternativa Antimilitarista.Moc”, 335 people, from 30 provinces of the Spanish State, refused in 2018 to contribute their taxes to finance the armies and their wars when making their tax declarations . This action of collective disobedience was framed in the campaign of Fiscal Objection to Military Expenditure, now going since 1983, 35 years ago. A total of 35,888 euros was diverted to finance alternative projects for the defense of Peace and Social Justice. The Fiscal Objection to Military Expenditure is an act of Civil Disobedience that consists in the non-collaboration with the State when it comes to defraying the expenses used in preparation of wars and maintenance of the military structure. In this same period the State allocated 93 million euros a day to military spending and social control. 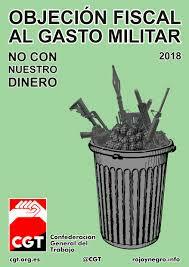 Almost 900 euros of each inhabitant of the Spanish state went to military spending. Recently the new Spanish Government announced it would refuse to sell more arms to Saudi Arabia due to the US backed continuing massacres and famine blockade of North Yemen .. 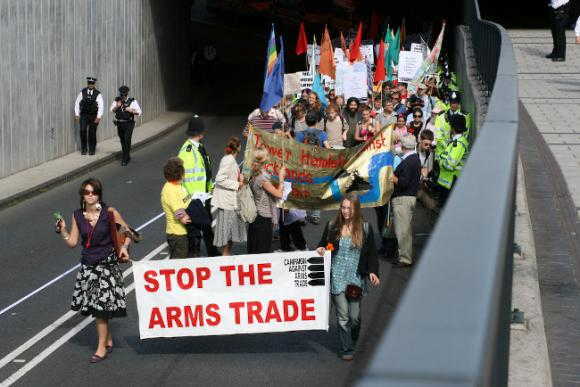 But just a few days later they REVERSED their decision and now allow the lucrative sale of armaments. Sep 13, 2018 – Spain reverses its decision to halt arms sales to Saudi Arabia. In September … Spain makes U-turn, will now sell 400 missiles to Saudi Arabia. Según el “Informe: Encuesta Objeción Fiscal 2018 de Alternativa Antimilitarista.Moc”, 335 personas, de 30 provincias del Estado Español, se negaron en 2018 a contribuir con sus impuestos a financiar los ejércitos y sus guerras a la hora de hacer la declaración de la renta. Esta acción de desobediencia colectiva se enmarcó en la campaña de Objeción Fiscal al Gasto Militar, en marcha desde 1983, hace 35 años. Se desvió un total de 35.888 euros para financiar proyectos alternativos, de defensa de la Paz y la Justicia Social.